Everything starts from a seed including us. I wonder if we live within that shell all our life with the seed being our soul and our lifetime here on earth being a gathering of all we need to slowly begin the painful process of cracking open. Many of us have felt the harder blows of life that leave an opening so wide that it goes straight to the heart of the soul. 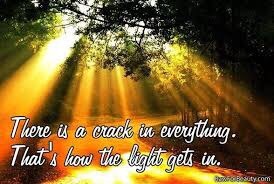 Whether our cracks are big or as small as a tiny papercut it is how the light gets in and once we experience the warmth it brings the more our soul craves it. Like our hands reaching upward we begin to sprout moving toward the unknown yet a knowing that it’s the natural process of who and what we were created to do. Yes, there is a comfort in staying within this place we’ve existed, and a fear of being exposed and vulnerable to the unknown. It’s never easy to step outside of our comfort zone to leave behind all that’s been a part of us, but the light continues to pull us toward it, and it is only in the letting go that we can fully begin to blossom in the fullness of the light. Most importantly let us not forget in the process of breaking free…to ring the bells that still can ring, and forget out perfect offering. Look around there are cracks in everything. It’s how the light gets in. Thank you for your wonderful encouraging response Nico. I value your thoughts.